Akonangui FC have been crowned champions of the Equatorial Guinea National Football League for the 2013 season. 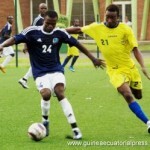 They beat The Panthers 1-0 in the playoff held on Friday (November 22) in Malabo. Bama Yangua converted a penalty on 27 minutes to power Akonangui to victory in the heated encounter that saw both teams finish with 10-men each. Federico Bicoro was given the marching off orders on 73 minutes whilst The Panthers goalie Achille Pensy also saw red seven minutes from time for handling outside the vital area. It is the fifth league crown for Akonangui after 1992, 1999, 2001 and 2008. Akonangui, based in Ebebiyin, a town located in the northeast part of Equatorial Guinea will play in next year’s Orange CAF Champions League whilst The Panthers will compete in the Orange CAF Confederation Cup. 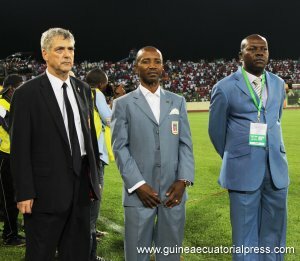 The journey of the La Roja was not only a success in sports, but also at the organizational level, in which Equatorial Guinea has again shown it is prepared to host any international event of the first order. Although the match aroused some controversy in the Spanish media, the Spanish Football Federation, confirming that La Roja played without any financial compensation, as had announced the Minister of Youth and Sports, Francisco Pascual Obama, and afterwards the President of the Spanish High Council for Sports (CSD), stating that “the Spanish Football Federation asked the CSD and the Government and we gave this authorization. If this event took place again, it would be the same. 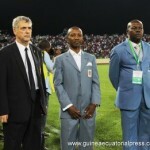 I have no reason to ban or veto a match in Equatorial Guinea. I recall that the President of Equatorial Guinea has been received in our country by Government presidents of the two major parties,” said Miguel Cardinal, settling the controversy. The Spanish Football Federation, led by its President, Angel Maria Villar, has an excellent relationship with the heads of the FEGUIFUT and this trip has served to strengthen those relationships, which in the near future may involve the establishment of new routes of collaboration that, in turn, will impact the improvement of the national sport. The Spanish federation delegation, which included the entire coaching staff and players, stayed at the Sofitel Malabo Sipopo Le Golf, where they had the fourth floor exclusively to themselves. The members of the delegation highlighted the quality of the facilities and idyllic setting of the hotel. The match had a maximum following in the country through the broadcast of RTVGE and in Spain was the most viewed of all the weekend on Spanish television with 4,448,000 fans and an audience share of 25.1%. 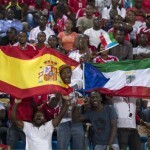 MALABO, Equatorial Guinea – Spain won 2-1 at former colony Equatorial Guinea on Saturday amid criticism of the appropriateness of the world champions playing a friendly in a country dogged by accusations of human rights abuse under its current president. Human rights groups had urged Spain to call attention to President Teodoro Obiang Nguema’s record of alleged human rights violations. The game, however, was played without any protest. Santi Cazorla opened for Spain in the 13th minute before Jimmy Bermudez pulled 119th-ranked Equatorial Guinea level in the 36th. Juanfran Torres slotted the winner in the 42nd. Midfielder Xavi Alonso was forced to leave the pitch in the first half in his first game back for Spain this season. 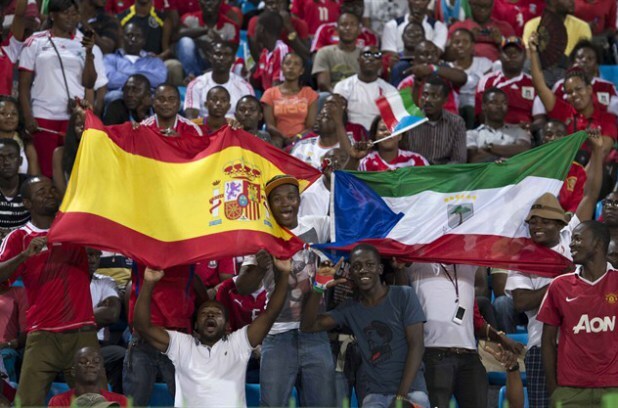 Spain became the first team from outside Africa to play in Malabo since Obiang took power in a coup in 1979 after the small African country gained independence from Spain in 1968. Opposition leaders to Obiang exiled in Spain also criticized the match, arguing it would help cleanse his tarnished image. Even so, the Spanish federation failed to clarify the reason for the friendly. The federation said it hadn’t received any extra fees to play. Its president Angel Maria Villar refused to answer any questions regarding the team’s trip earlier this week. Barcelona defender Marc Bartra started in his international debut for Spain. Alonso made his return since missing last summer’s Confederations Cup due to injury, but he had to be substituted after being fouled by Thierry Fidjeu. Real Madrid lost Alonso’s midfield partner, Sami Khedira, for six months after he tore a right knee ligament playing for Germany on Friday. Spain dominated early and went ahead when Cazorla tapped in a cross goalkeeper Danilo Clementino let slip through his hands and fall to the midfielder in front of the open net. Equatorial Guinea gave Spain’s untested pair of centre backs Bartra and Inigo Martinez work as it sought to equalize through Ivan Bolado and Javier Balboa. Balboa passed for Bolado to volley the ball off Bartra inches over the crossbar, and Bermudez headed the resulting corner kick off the turf and beyond goalie Pepe Reina to ignite the 18,000 home fans. Spain regained the lead while briefly playing with 10 men waiting for Sergio Busquets to replace the hurt Alonso. Juanfran started a move that ended with the Atletico right back blasting in a rebound after Danilo blocked a cross. Spain will next travel to South Africa for a friendly on Tuesday, its first trip to the country since it won the World Cup there in 2010. Spain qualified first in its group for next summer’s World Cup in Brazil, where it will look to defend its title. Spain coach Vicente Del Bosque described Equatorial Guinea as an ‘awkward’ opponent after his side’s 2-1 win on Saturday. 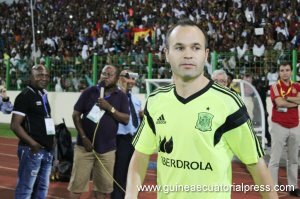 More than 12,000 supporters went to the New Stadium of Malabo to watch the training of the Spanish national team, who responded affectionately to the visitors and to the enormous join of the great Equatorial Guinean fan base. 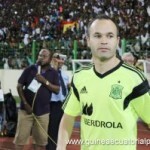 At least three-fourths of the New Stadium of Malabo was filled to see the training session of the Spanish team. The players were received like authentic idols and the names of the Spaniards did not cease sounding during the entire session. Vicente del Bosque prepared a series of exercises that included a brief game, watched with the maximum expectation by the spectators. At the same time, the players of La Roja enjoyed the warmth of the supporters that made them feel at hom. The most acclaimed were Iniesta, Casillas and Ramos, although there were fans for the entire team. In view of the match it is envisaged that Spain will form a team integrated by reina, Juanfran, Bartra, Iñigo Martinez, Alberto Moreno, Koke, Xabi Alonso, Cazorla, Navas, Mata and Negredo. Finally, the last phase of the National Football League will be held starting on Wednesday, November 13, at the La Paz Stadium of Malabo. Despite the financial problems that have hindered the completion of the national football championship, this last phase of the league -known as Playoffs- is now confirmed, and will be held at the La Paz Stadium in Malabo from November 13 to 23. 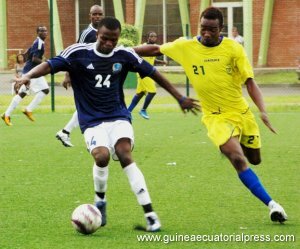 The agreement was adopted at last week’s meeting between the staff of the Equatorial Guinean Football Federation (FEGUIFUT) and the eight teams qualified for the last phase of the league. The FEGUIFUT bears all the costs of the teams. 14 h.: Leones Vegetarianos-Campo Amor 16 h.: At. Semu-Akonangui F.C. The matches will be of a single round and the team with the most points will win the league and will play the 2014 African Champions League. Vicente del Bosque’s side are already scheduled to play South Africa in Johannesburg on 19 November. The match will take place at FNB stadium – the same venue where Spain secured their first ever World Cup in 2010. Del Bosque will name his squad for both matches on Thursday. Atletico Madrid striker Diego Costa is expected to receive his first call-up after declaring his intention to represent Spain rather than Brazil, the country of his birth. 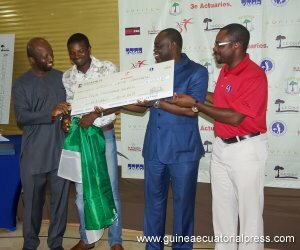 On Sunday, October 20, the golf course at the Hotel Sofitel Sipopo Le Golf was the venue of the first International Pro-Am tournament in Equatorial Guinea. 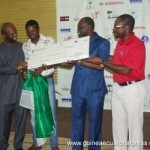 The winner of the professionals was the Nigerian Odoh Oche Andrew, while in the teams, Somagec won. 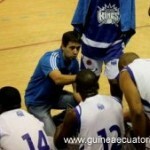 The first Pro-Am that took place in Equatorial Guinea can be considered a success, and has had professional players from Africa and Europe. The formula of a professional playing alongside three amateurs has allowed all participants to enjoy the great course of the Sofitel Sipopo Le Golf, and learn from the play and instructions of the professionals. Regarding the results, we can highlight the victory among the professionals of Odoh Oche Andrew, of Nigeria, followed by Dufresne Valeri, of France, Tarik Benslimane, of Morocco, and Willy Gift, also from Nigeria. Among the teams, Somagec was the winner, led by Tarik Benslimane and composed of the amateurs Adrian Constantinescu, Camelia Constantinescu and David Magallanes. Then the following teams were Mobil, 3e Actuaries, CCEI Bank, Cronos and ZTE. Several Equatorial Guinean players participated in the tournament and two of them, Carmelo Martin Modu and Juan Epitie -former football player of the Nzalang- triumphed with the ZTE team. The awards ceremony took place in the Sipopo Golf Club, and was chaired by the Vice Minister of Youth and Sports, Manuel Asumu Kawan, who was accompanied by the FEGUIGOLF leaders with its Chairman and Minister of Mines, Industry and Energy, Gabriel Mbega Obiang Lima at the head, and all the sponsors. 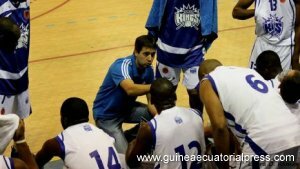 Equatorial Guinea basketball is in full celebration, since the Malabo Kings have qualified for the top club competition in Africa, after winning the title in the previous phase held in Kinshasa. The eliminations of the previous phase of the Champions Basketball League, which took place in Kinshasa (Democratic Republic of Congo), concluded on Sunday with the grand finale, in which the Malabo Kings defeated the Tabi B.C. of Gabon by 75-63. Of the six games played, the Malabo Kings lost one in the initial phase against Tabi B.C., in a difference of four points, while in the final they won by twelve. From October 18 to 20 in the golf course of the Hotel Sofitel Sipopo Le Golf will take place the first International Pro-Am, which will feature professional players from Africa and Europe.